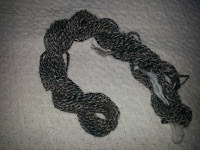 I thought I had all the braid spun till yesterday. 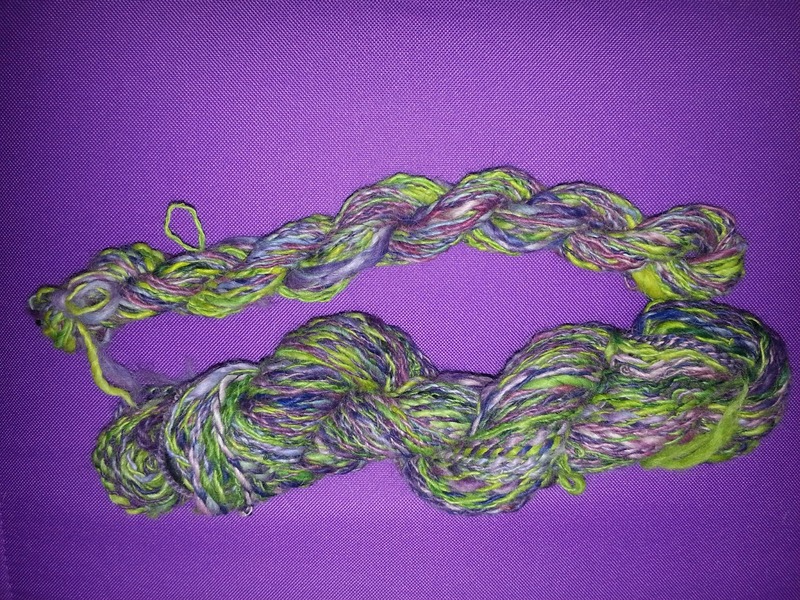 I found the last half and spun that yesterday and plied today. I used the turkish spindle to wind the shorter parts that were left on my jumbo bobbins into cops then plied from them to use up the entire braid. 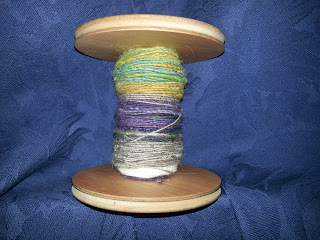 Here's what I spun Saturday and posted for Tour deFleece. 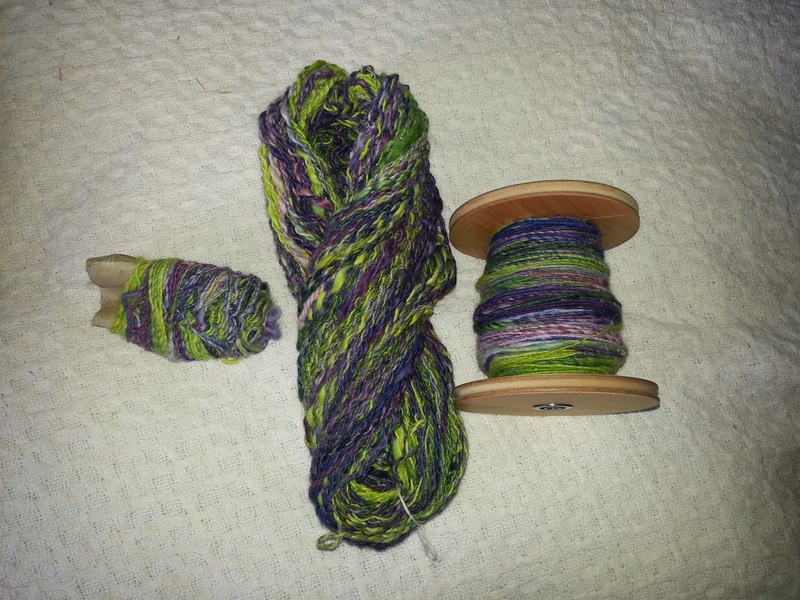 The bobbin and little bunch on the left is what I plied today. The big skein in the middle is a bunch of purple singles spun and plied on Friday. This was the start for me. 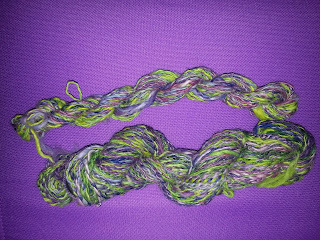 To observe and participate in Opening Day of Tour de Fleece, I did a spinning demonstration for my Crochet and Knitting students. What a wonder it was to have a hummingbird family in our tree in the backyard. I set up my camera and took lots of pictures, and even a video. It was great to watch their progress every day. The white in the nest is my cat's fur. He pulled his mats out in the backyard, and Mama Hummingbird liked them just fine. It was a real challenge to shoot these pictures. The camera had to face west into the sun and then focus tightly on a moving tree branch. I learned a lot! 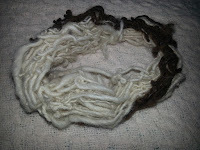 Here is the link to my inspiration board for The Dyer's Notebook DAL group on Ravelry. I'm going to be dyeing tomorrow or by the end of the week. I teach on Saturday so that's my deadline to be done by then. My camera is getting really cranky lately so I don't know if I'll use that or my phone for pics. Yarn pictures there will be however. I hope I can do better this time around. I have much more to share and talk about in August. I look forward to writing again. I finished my Serenity socks Monday. I have them on my feet as I type. I'm very happy with them considering I knitted them mostly without a pattern in front of me. I used Deb Barnhill's Back to Basics toes from Knitty.com and Cat Bordhi's Sweet Tomato Heel that debuted at the Sock Summit. The heel is great, but next time I use it I want to do the reinforcement stitch - the sl1, k1 to make the heel wear better. I'm enjoying the socks. They are wearing nicely, fit Great, and wash well. I haven't dried them in the dryer. I just can't do it yet. 15 Working Days till retirement, but who's counting? !